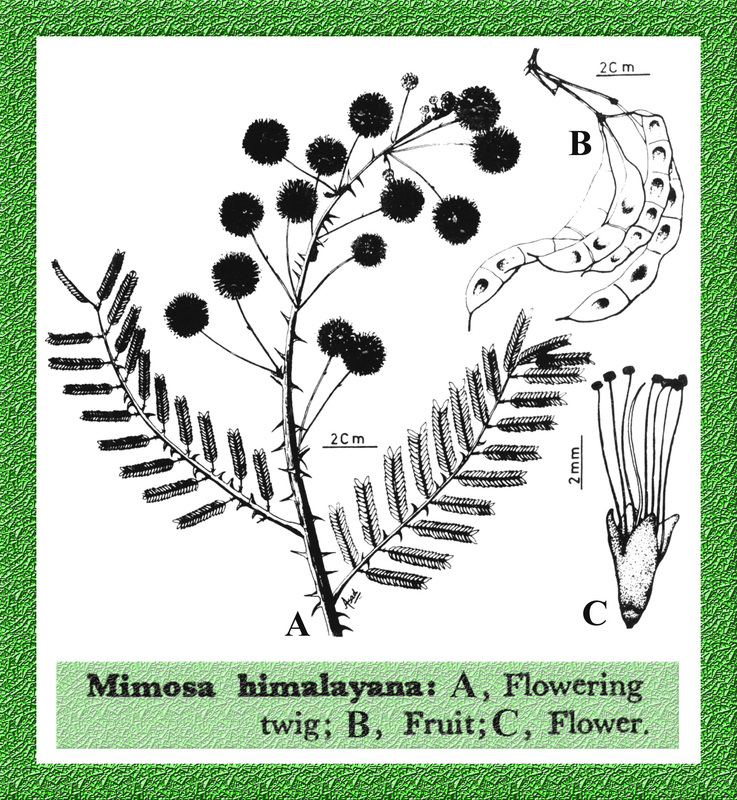 Mimosa himalayana Gamble in Kew Bull. 1920: 4. 1920. A large straggling deciduous shrub, branches ribbed, densely hairy; prickles present on nodes or inter nodes, straight or hooked, 4 mm or less long. Leaf bipinnate, rachis 10-23 cm long, prickly, prickles mostly hooked, hairy, ribbed; pinnae 5-12 pairs, 2.5-6.5 cm long. Leaflets 6-15 pairs, 3-8 mm long, c. 2 mm broad, oblong, obtuse, mucronate, glabrous above, more or less hairy below, subsessile. Inflorescence globose penduculate head forming terminal panicle; peduncle c. 2.5-6.0 cm long, pilose, head c. 1.2-1.5 cm across. Flowers pink fading to white, pedicellate, pedicel minute; bracteate, bract small, linear, ciliate. Calyx c. 1 mm, hairy. Corolla c. 3 mm long, tubular, 4 lobed, lobes c. 1 mm long. Stamens 8, long, exserted. Ovary short stalked, glabrous. Fruit 6-10 cm long, 1.0-1.3 cm broad, occasionally with prickles on the sutures, strap-shaped, glabrous 4-10, 1 seeded joints, which get separated from the sutural frame. Lectotype: Simla, Aug. 9, 1831, Lady Dalhousie (k). Distribution: W. Pakistan, (Punjab Kashmir) ; India, (Punjab, Uttar Pradesh, Bihar, Orissa, Bengal, Assam, Central Province, Madras); Sikkim; Afghanistan. It is considered useful for hedges. The wood is suitable for tent pegs and for making gunpowder charcoal. The root, leaves and fruits are of minor medicinal importance.